Dual monitor setups on desktop can be pretty amazing and help your productivity, but what if you could have that on your phone? The popSLATE 2 case for your iPhone is the closest you'll get to having a dual monitor on your phone, and it only adds .16" to the thickness of your phone. The popSLATE 2 is a protective case for your iPhone 6, 6s, 6+, and 6s+ that gives you an always on e-ink display directly on the back of your phone. 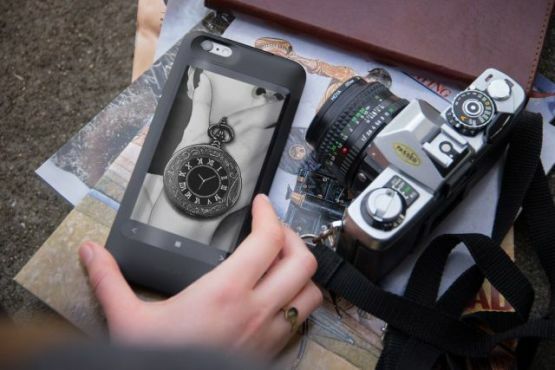 By using an e-ink display, the company was able to minimize strain on your battery, but to make sure you're not left stranded without your phone, the case includes an extra reserve battery that gives you an additional 9 hours of talk time (or approximately 4 hours of browsing). The case is designed to be shatter-proof and the anti-glare screen means you can use it anywhere, in any lighting conditions. You can easily customize your back dashboard to display the things you'd most like to see at a glance, with real time smart alerts similar to those seen on smartwatches, but instead of seeing them on an small screen, you get a full display on the back of your phone. The case also states you'll save battery in the long run by eliminating many of your iPhone unlocks to check small things. For the readers among us, the popSLATE 2 can also be used to read books directly on the back of your phone, while saving battery thanks to the e-ink technology. It also means you don't have to haul around an extra device to read your books on. The popSLATE 2 is currently being funded on IndieGoGo with early bird pricing available to backers. If you're interested in this case, getting in on early bird pricing will most certainly save you some money as the case will go for approximately $130 USD on actual release.